Home / Alden Richards / GMA Network / Video / Alden Richards' last kiss to Kuya Germs at the "Kapuso Countdown to 2016"
Alden Richards' last kiss to Kuya Germs at the "Kapuso Countdown to 2016"
It was during the Kapuso Countdown to 2016 held last December 31, 2015 at the Mall of Asia grounds that we last saw German Moreno, popularly called Kuya Germs, appear in television. And little did Alden Richards knew it was the last time he would be able to greet the Master Showman a Happy New Year and kiss him on the cheek. Alden greeting Kuya Germs during the GMA New Year Special 2016. 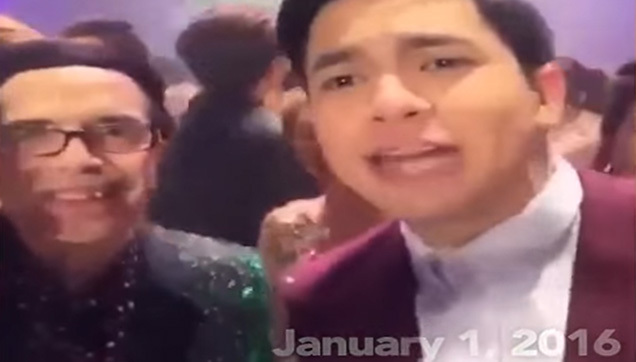 In the video below, you will see Alden happily greeting him a Happy New Years, and fondly calling Kuya Germs 'Tay'. It was a joyful celebration now tinged with sadness as Kuya Germs died after suffering from cardiac arrest last January 8, 2016. It's not how much we give but how much love we put into giving, that's Kuya Germs. Rest in peace Tay. German "Kuya Germs" Moreno was laid to rest on January 14, 2016 at the Loyola Memorial Park in Marikina.